Ten Special Operations veterans participate in a nine-day workshop set in a remote location in southwest Montana. The workshop, staffed by Special Operations veterans and transition experts, guides participants through the life of service, the difficult decisions surrounding transition, and the challenging landscape of the civilian sector. Utilizing performance applications and goal setting exercises, participants learn to harness strengths that leverage the skill sets Special Operations veterans deliver in the civilian world. Veterans connect with leaders in the private sector who are committed to the transition process, accelerating discussions on strategies to achieving goals and milestones critical for realizing success. Veterans demonstrate intangible skills that make their experiences valuable, while leaders in the civilian sectors gain a better understanding of their role in military transition. Upon completion, participants receive individual transition support for up to twelve months, further preparing for purpose-driven lives beyond uniform. VETERANS: must be eager, motivated, hard working combat veterans who served in the Special Operations Community since 9/11/01. Applicants must be able to fully participate for the entire program without external requirements. 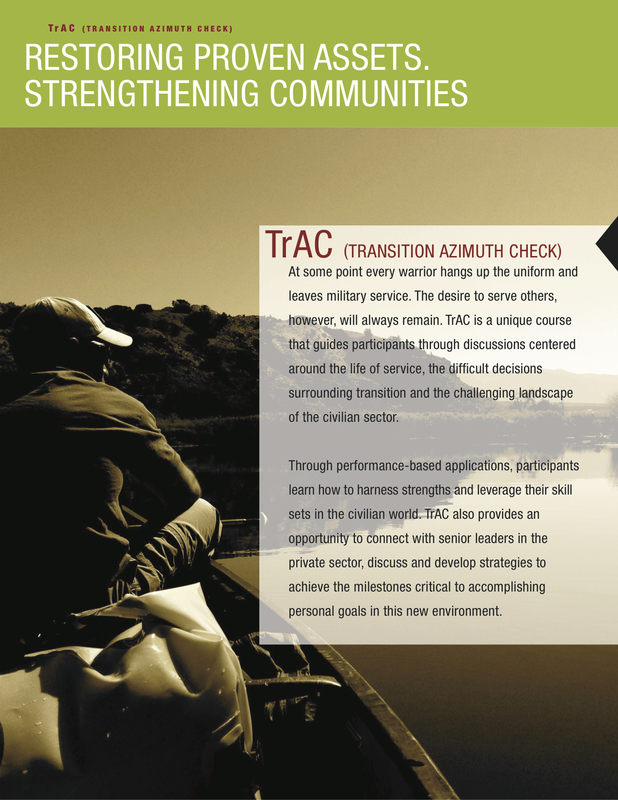 Successful alumni of TrAC possessed the willingness and drive to answer the challenges ahead, arriving in Montana prepared to tackle the dynamic and uncertain paths of transition. Submit applications to programs@thestationfoundation.org no later than 30 October 2015. Be prepared for telephonic interviews during the selection process. Notification of acceptance occurs prior to 06 November 2015.